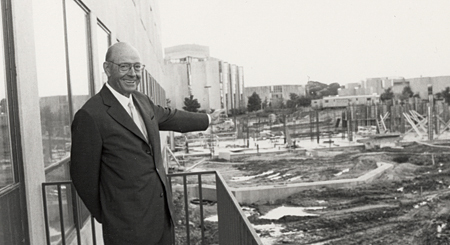 Welcome to his world: James L. Allen smiles in 1986 knowing that the new atrium addition to the Kellogg School Executive Education facility that bears his name will enhance the initial building that opened in 1979. Allen, a Northwestern University trustee and a co-founder of Booz Allen Hamilton, was a champion of executive education, raising millions for this effort at Northwestern. As the demolition crew moved onto the Evanston campus in June 1970 to dismantle Memorial Hall, onlookers may have wondered if Joseph Schumpeter's economic theories of "creative destruction" were being realized. For indeed the old structure was literally being consumed to give birth to the new. Memorial Hall had stood near Sheridan Road and Foster Ave. since 1887, first housing the Garrett Theological Seminary and then, in 1923, after a $100,000 facelift, opening its doors to accommodate Northwestern's burgeoning School of Commerce, which had operated in Evanston out of Harris Hall since 1915. But the program had actually originated in 1908, located in downtown Chicago in Tremont House at the corner of Lake and Dearborn. It had begun as little more than a trade school, a response to what Northwestern University President Edmund James indicated was a dire social need. "The average business man is ignorant and inefficient and cowardly," claimed James in 1902. "He is helpless in a crisis." With an operating budget of $5,000 and the support of some 60 Chicago business leaders, notably Joseph Schaffner, university trustee and a founder of Hart Schaffner and Marx, the commerce school admitted 165 part-time students in its first year and charged $75 per annum for tuition, requiring those enrolled to sign a document attesting to their "good moral character." Since that time, the undergraduate business program had grown and represented not only a proven source of revenue for the university, but was now "very well respected," according to Professor Wally Scott, whose grandfather, Walter Dill Scott served as Northwestern's president from 1920-1939 and produced path-breaking research into the psychology of advertising and personnel management. Professor Emeritus Lawrence G. Lavengood also notes the strength of the program, recalling it as "premier" and one enhanced significantly after 1950, in part through the support of the Ford Foundation, which had grown into a national force for education and other social causes. Nevertheless, Dean Barr's Business Advisory Council, itself part of a broader Management Educational Policy Committee whose membership roster read like a Who's Who of Chicago's senior business community, had begun five years earlier exploring the future of business education, determining that real-world demands called for a more sophisticated manager than what the undergraduate program was likely to produce. "Northwestern University should strive for an innovative and leadership position in management education," the Council wrote in its April 1968 "Proposed Statement of Recommendation." To accomplish this end, the university should create a school of management that would "encompass the development of managers, the conduct of research, and the development of teachers of management for organizations of all types - business, government, health and education." Given the university's limited resources, the Council, chaired by Jim Allen, recommended that rather than try to stretch itself too thin with mediocre results across the board, Northwestern should take a calculated risk and phase out the undergraduate curriculum even though it was successful, and despite the challenges of building a sizable new graduate program. 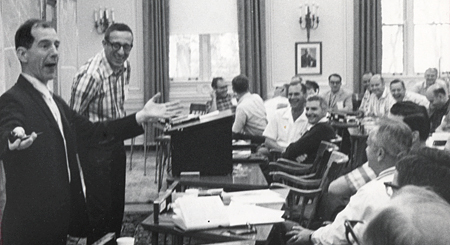 Another era: Professor of Business History Gene Lavengood, left, regales a class in the 1960s with the ready assistance of Finance Professor Donald P. Jacobs. Note the ashtrays and cigarettes on desks and the pipe in Lavengood's hand. The Council based its recommendations upon its research - which included a broad survey of business and education professionals - that suggested public organizations faced similar challenges to those seen in the business world. Furthermore, the complexity and expansion of the non-business arena presented an "urgent requirement for trained managers in nonprofit organizations." What's more, the Council noted the serious sociopolitical rifts, including the debate over the Vietnam War, which was then dividing the country. On many campuses, students wanted little to do with the "military-industrial complex" and frequently turned to law schools, rather than business schools, looking to make a social contribution. "The intellectual questioning and striving of our young people today for new answers and new directions, especially in regard to matters of public concern, argues well for the appeal of ... a school of management [which] might help to overcome the disenchantment of some bright young people with careers in business," wrote the Council in its recommendations. The decision to do away with a successful undergraduate program seemed dubious to some, particularly those with vested interests in the curriculum, such as faculty hired specifically to teach the younger students. And some students themselves felt passionate enough to protest the decision, which they saw as placing their careers in jeopardy. "Eliminating the undergraduate program changed the faculty to a degree," says Ralph Westfall, who was associate dean for academic affairs from 1965 to 1975. "It was clear that the MBA program was going to be driving business education in the future, and this is where you wanted to have your main focus." To be successful in this new mission meant recruiting the best research-based faculty that would, in turn, attract the best students. The school's Marketing Department already boasted such paradigm-shifters as Philip Kotler and Sidney Levy, and even earlier had influential scholars that included Richard Clewitt, Harper Boyd, Steuart Henderson Britt and Westfall himself. Still earlier, Fred Clark's 1922 text, Principles of Marketing, had helped establish the entire discipline, while Delbert J. Duncan and Ira B. Anderson produced important scholarship in the retailing arena. But this level of thought leadership would now have to suffuse the school, and continue extending the boundaries of management research. 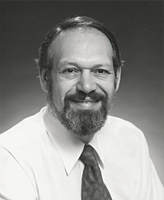 The arrival of Professor Stanley Reiter in 1967 was a watershed event, and the school's research-based faculty would soon hit its stride. Westfall was among those responsible for bringing in key faculty members, including Stanley Reiter, Morton Kamien, Nancy Schwartz and David Baron, all of whom helped create the school's potent Managerial Economics and Decision Sciences Department (MEDS). The rigorous analytical frameworks of this discipline would influence all areas of the school, including complementing the important contributions of the Organization Behavior Department, which was instrumental in creating the famous Kellogg collaborative learning model. "We made no bones about it when we talked to prospects: This was going to be a publish-or-perish situation that they would be walking into here," says Westfall. "If that wasn't what they were looking for, then they didn't want to consider Northwestern. If they were looking [to be part of a research-based team], we had a good product to sell. We were very successful in recruiting good people." Indeed, top-caliber faculty then soon attracted more talent, including Mark Satterthwaite, Ehud Kalai and others. "Stan Reiter's arrival here in 1967 was a watershed event," says Robert Magee, the Keith I. DeLashmutt Distinguished Professor of Accounting Information and Management. "Over the next 15 years, he and his fellow MEDS faculty members built arguably the best economic theory department in the world." Reiter recalls his goals upon arriving at Northwestern. "I wanted to be part of establishing the research foundations in an MBA school," says Reiter, who was recruited from Purdue where he had been part of a team that created that school's Department of Economics. "The mission [at Northwestern] was to train future managers. Well, in what? Are you going to show them how to file? There were significant developments going on in economic theory, statistics and operations research. But these things were not so sharply separated or defined." Says Reiter: "I saw my mission here as bringing in the people to create a new department out of the ashes of the old establishment," one that drew upon a range of quantifiable sciences that were "foundational ... to lots of things that go on - or should go on - in schools of management." "It also scared the hell out of a lot of people," says Reiter. When Memorial Hall came down, more than a building disappeared. The wrecking ball took with it the vestiges of the undergraduate program and propelled the school into a future that was uncertain, but clearly promising and ambitious. By then, faculty members were ready for this exciting change, says Jacobs. "Nobody wanted to keep that building up," he recalls. "The wood was creaky and the faculty offices weren't very nice. It was interesting looking from the outside, but it probably lived 50 years beyond its real life." Faculty, he says, embraced the hopes symbolized by Leverone Hall, the newly constructed Evanston home of the full-time graduate management program, which opened in 1972. Some $5 million for the project had come in 1968 from Nathaniel Leverone, the founder and president of Chicago-based Canteen Corp., a pioneering vending machine merchandiser. 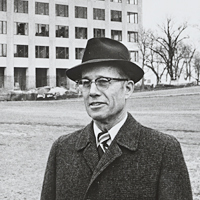 This initiative formed part of a larger $180 million effort dubbed the "First Plan for the Seventies," led by Northwestern President J. Roscoe Miller. Modern times: With construction on Leverone Hall nearly complete, Associate Dean Ralph Westfall surveys the progress in style, circa 1972. Associate Dean Emeritus Ed Wilson, hired by Henderson in 1972 as director of admissions and financial aid, also accents the move's impact on student culture, which proved especially important as a unique hallmark for the school. After Leverone Hall opened, "students now had access in Evanston to the university library and recreational centers, the religious centers, playing fields, all of which really changed the character and quality of student life from being urban to suburban." Still, some retained fond memories of Memorial Hall long after its destruction. "The Little Red Schoolhouse was an affectionate name," Lavengood said in an interview more than a decade later. "But the building was not a meager one. It had generous halls and there were many large classrooms with windows you could actually open and shut. We had high ceilings for high thoughts. There were surprising nooks and crannies and sudden turns that I think preached a useful moral lesson, which was: Be sure you know where you are going." The Kellogg School did. It was headed to international acclaim and would soon land at the No. 1 spot in the rankings. In upcoming issues of Kellogg World: We continue exploring the events and people responsible for taking the Kellogg School to worldwide renown.